"Smart" phones offer the intelligence of a computer, with the convenience of a phone. "Smart" meters let homeowners choose between using cheap and expensive electricity. The next frontier: "smart" trash? A 5-year-old group at the Massachusetts Institute of Technology has spent the last year attaching thousands of tracking devices to pieces of garbage in Seattle and New York City. The devices send out pulses to signal where they are. The signals go to MIT's SENSEable City Lab for analysis. Last year, they also went to art exhibits in both cities, where live maps revealed the many paths garbage takes. 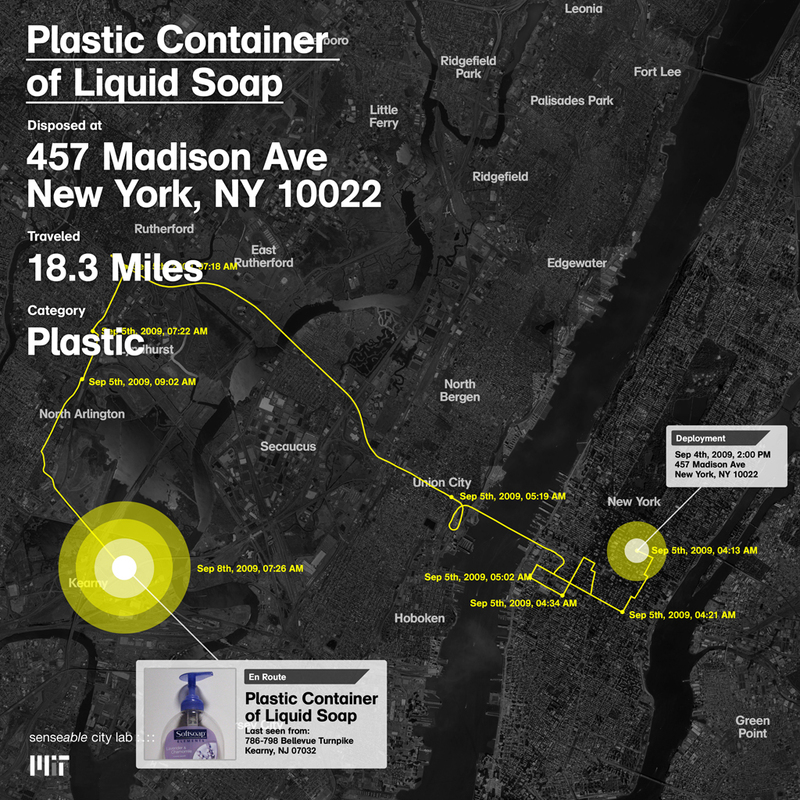 For example, a plastic soap bottle tossed in a Manhattan recycling bin took several twists and turns around the city before crossing the river to Kearny, N.J.
Carlo Ratti, who directs the City Lab, said each city he's lived in -- Turin, Italy; Paris; Cambridge, England; Boston -- has suffered from congestion, pollution and inefficiency problems. He believes new technologies, like iPhones, social networking and wireless communication, can inform city dwellers and make cities "smarter." "The only way we can actually solve some of the big problems, like climate change, is if we really coordinate and act together," Ratti said. "What, for the first time, is really bringing us together is the power of networks in general and the Internet." One product was the "Copenhagen Wheel," a device that attaches to a bicycle and offers information on how much people are riding and where -- in addition to giving a little boost on the uphill. The lab has also designed interactive screens for bus stops that can communicate with an iPhone, tailoring advertisements to riders or serving as a larger screen for hand-held diversions. The aim of project "Trash Track": to study where recyclables go. Dietmar Offenhuber, a doctoral student in the lab, said there's plenty of research on how things are made, but little is known about how they degrade and finally disappear. Among the questions here -- especially for cities paying millions for recycling programs -- are how much greenhouse gas is created and how much energy is wasted in the process. Another might be whether recycling really happens. "Even the people working in waste removal don't really have a clear knowledge or picture of where the stuff goes," he said. That's partly because trash goes through so many handoffs en route to its final destination, Offenhuber said. Trash companies follow their own haul, for example. But once they separate the aluminum and sell it to a collector, their records end. No single database tracks a soda can through its cycle. Environmental groups and sustainability-minded cities have taken interest in the technology, since it could add credibility to the recycling system. There's been cause for doubt, particularly with electronic waste. Last November, the CBS program "60 Minutes" followed a suspicious crate leaving a Denver-area company that claimed to recycle its e-waste in the United States. The crate ended up in Hong Kong -- illegally, since the United States prohibits export of e-waste containing hazardous materials like lead. The investigation also found gruesome health conditions in a Chinese town whose economy was devoted to scrapping e-waste. The story said a mass underground industry transfers electronics from wealthier nations to poor, less-regulated countries. In the United States, tracking trash can also reveal whether recycling benefits the climate. Recycling is supposed to recover energy-intensive materials and thrust them back into the production chain. But early returns from Seattle, Offenhuber said, show that telephones and printer cartridges get shipped across the country -- to Chicago, Miami and New York. "Because the recycling process itself generates, of course, an environmental burden, this burden is also depending on the transportation distance," he said. "So if you have an object that yields very little energy in the recycling process, and you have to carry it through the whole country, then you have probably a higher environmental burden than gain." Will Trash Track draw commercial interest? The tracking devices, roughly the size of a pager, were built by Qualcomm, a major wireless communications firm. Those devices were tracked by Sprint, whose networks of towers triangulate individual pieces of trash. Waste Management, which provides trash and recycling hauling for about half of Seattle, also participated. A spokeswoman for the company said it has no future plans to use the devices, however. Sprint spokesman John Taylor said, "It's not something that Sprint is prepared to market right now," but that if someone proposed a Trash Track-like program, the company might consider it. Sprint currently collects phones for recycling, but it has no way of tracking where the phones go once its partner, UPS, takes them. That doesn't upset Ratti, who thinks of his research projects as enlightening the public. "Usually we consider them successful not only if they get published in top scientific journals, like Nature or Science, but also if they go to the MoMA," he said, referring to New York's Museum of Modern Art. "We think that it's important, the vision, and the vision for a possible future is what usually we got into the museum." But according to Offenhuber, telecom companies are watching Trash Track to see if it can be scaled up. By the end of this year, he said, the SENSEable City Lab wants to deploy thousands more trackers, and it wants to focus on e-waste. That will help the companies develop a tracker that's cheaper and easier to use. Ultimately, the device may even come in a tracking "kit" that lets someone attach it to an item, then log on to a Web site that tells its whereabouts. Can a "Hub" Boost Building Energy Efficiency Efforts? Where, Exactly, Does Your Garbage Go After You Toss It out?